Indian Bollywood cinema hasn’t been prone to supernatural elements, but the latest Rohit Shetty film brings in the horror-comedy genre which is gaining popularity at the box office. The film Golmaal Again, a continual sequence by Rohit Sharma, has become the very first horror-comedy film to hit Rs.100 crore mark. It was around 9 years back when the century club was pioneered by Ghajini and ever since 2008, 58 films have crossed the Rs.100 crore milestone. Thus, box office witnesses 6 centuries at an average every year. The most successful genres have been-human drama, social amendments, and action-comedy, but among any of these century makers, none of them have ever featured a horror-comedy. 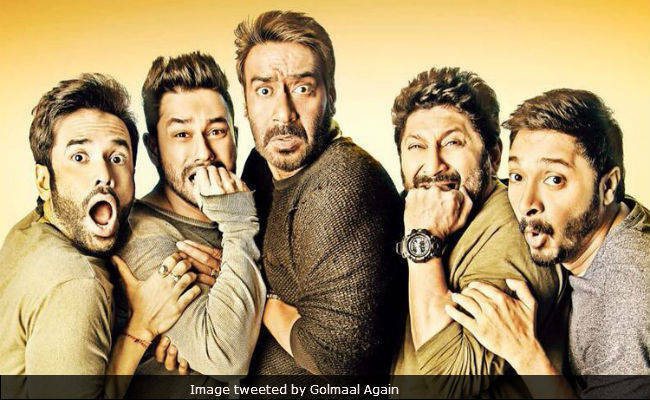 Golmaal Again has now created history in a matter of less than a week. “Horror films have become extinct in the recent years and horror-comedies are anyway hard to come by. Leave aside horror, even supernatural elements haven’t really found a place in Bollywood comedies that cater to family audiences,” says a trade expert. He gloomily says that Great Grand Masti has been the only horror-comedy film that pops in the head, but it too was an adults-only affair. Rohit Shetty is a fabulous director and he has been successfully able to blend the supernatural element in his own comic narrative. Golmaal Again, being a family comedy, has been able to satisfactorily entertain the audience is Diwali. Rohit Shetty and Ajay have built a very strong franchise past the years. A crew member addresses, “This is a kind of film where you would laugh at all the supernatural jokes and thoroughly enjoy the fun ride that is on the offering. It is a unique fusion by itself and something new that’s being offered to the audience.” It seems like the movie do possess a unique plot which is being admired the Indian audience. The film is expected to easily cross the Rs.150 crore mark by the next week. Furthermore, analyzing the audience response, filmmakers will be encouraged to try out new trends, experiment more genres and revolutionize the Indian Bollywood. Dhadak rakes in upto Rs. 33 Crores in the first weekend; With a great opening, numbers expected to rise in the upcoming days!